Dr. Noy and I went to the Diageo Toastmasters Club at their office in Diageo at Laguna Technopark. Not many know that Diageo is the maker of known liquors like Gilbey's Gin and Smirnoff Vodka. Toastmaster of the Night was Khris Albano. The theme for tonight's meeting was "United We Stand, Divided We Fall" and everybody was given a chance to give a few words on the theme. I evaluated Fritz's Speech Project #3 entitled "Filipinos and Music". Fritz's speech was about the seemingly natural and exceptional talent of Filipinos with singing and music in general. Dr. Noy evaluated John Paul Guzman for his Speech Project #3 entitled "Hip-Hoppin". The speech showcased John Paul as an accomplished Hip-Hop dancer as he explained the various Hip-Hop terms with dance moves. Outstanding! John Paul will be Diageo's representative in the Area 77 Quartethlon on Sept. 9. I delivered "The Extra Mile" as Speech #2 in The Entertaining Speaker - Resources for Entertainment. 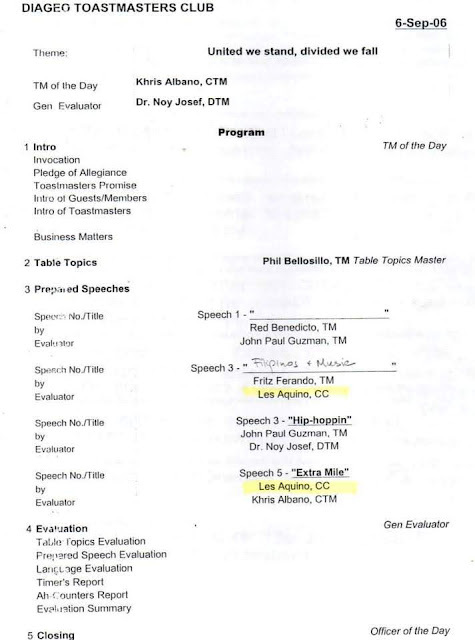 My speech was evaluated by Khris Albano. This speech will be my contest piece for the Prepared Speech Category in this year's Area Level Quartethlon Contest. Shown below is the scanned copy of meeting program.